Vodka is an alcoholic drink which is pretty much made up of just water and alcohol. It is either drunk neat or mixed with other drinks, often to make vodka cocktails. It is distinguished from other alcoholic drinks by its unique feature of having no lingering smell on the breath. It is popular in many countries around the world. 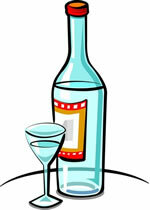 Vodka started off being used as a medicine in Eastern Europe and was quite different to the vodka that is found today. It had a much lower percentage of alcohol, perhaps just 14% compared to up to 40% today. It also had a different flavour and colour, probably due to the change in distillation process and the addition of different ingredients. Several countries claim that vodka originated in their countries and as it started being produced so long ago, it is difficult to prove that either way and to put a date to when it was first made. Russians believe it started in their country and they started commercial production and filtration before any other country, and thus they promote Russian Vodka. However, Poland put forward a good case as well, they also had good early commercial production of Vodka in their country. Vodka is usually made from wheat although rye can be substituted to save on cost. However, in Poland potatoes are favoured and these give a higher calorie and higher alcohol vodka. In the US vodka is made from corn which gives a sweeter, popcorn type flavour. Recognised brands tend to use columns to brew quickly and artisan brewers use copper stills where the flavours can develop better. After charcoal filtration the vodka has water added to reduce the alcohol percentage to an acceptable level. Sometimes flavourings are added at this stage, but this very much depends on the distillery and the market it is serving. Many people distil their own vodka and have done in the past as well, especially in countries where vodka making was restricted. It is felt that some of the popularity of vodka comes from the fact that it leaves no trace of alcohol on the breath, so no one knows that you have been drinking. It also has no flavour, which means that it can be mixed in to drinks and cocktails without changing the flavour. Vodka is often available for sale with different flavours these days which are either produced from distilling it from different things form the normal grains or potato or from adding flavourings to it. This is partly because in the USA vodka must have no flavour, so flavours are added to make it more interesting. Some of the most well-known cocktails made with vodka are the Bloody Mary, Cosmopolitan, Harvey Wallbanger, Long Island Iced Tea, Vodka Martini and Screwdriver. There are many others though and vodka can sometimes replace whiskey and gin in cocktails because it has less of a flavour. Many people will just add vodka to fruit juice and other mixers though. Vodka is often used as an aperitif but it does work well with fatty meats where it cuts through the heaviness. It can also be used for cooking with and is often added to sorbets, espresso or with tomato based pasta. Many people will add it to fruit based dishes, as well as ones with tomatoes. There are many vodkas on the market. You will find that they will differ in their nose and palate and so you may need to taste various types to get an idea of what you like. You should get some idea from looking at the bottle as to the flavours as well as what it is brewed from. You will also need to consider whether you are going to be using it neat, mixed with other drinks or in cooking, because that will change the flavour that you will need. For example a sweeter vodka may not be suitable to go in savoury dishes but good for mixing with fruit juices. In USA vodkas have to have no flavour and so the only way to choose between them is by price and percentage of alcohol. Copyright © 2019 VODKA Network. All rights reserved.